Bishop Michael Bunluen Mansap, retired bishop of Ubon Ratchathani, who founded the Catholic Council of Thailand for Development (CCTD) and also the Thai Church’s Justice and Peace Commission, has died aged 81. “Bishop Bunluen was among the first (Catholic clergymen) who talked about and taught the Catholic social teachings,” said Rungrote Tangsurakit, former CCTD manager and CCI Asia-Pacific coordinator. The bishop rallied Thai people of all religions to tackle social injustices, ucanews.com reports. “During the coup d’ etat in 1992, Bishop Bunluen pushed the Thai Church to declare its position on solving political problems by peaceful means and with respect for people’s human rights. Before this, the Thai Church had always been quiet on these matters,” recalled Rakawin Leechanavanichpan, former coordinator of the justice and peace commission. Bishop Mansap had even earlier this year called on the government and “red-shirt” demonstrators to renew talks after violent clashes left several people dead and hundreds injured. “What endangers the country is not civil war, it is anger and hatred, and there seem to be lots of people with hatred today.” He urged all Thais to accept different opinions and beliefs. “All humans have the potential to love each other but are divided by politics and ideology,” he said. The so-called “red shirts,” a loose coalition of political activists and supporters of ousted premier Thaksin Shinawatra, have been encamped in Thailand’s capital for nearly a month. They claimed the government of Abhisit Vejjajiva is illegitimate and were calling for the immediate dissolution of parliament and early elections. Bishop Mansap was also in charge of the Thai bishops´ Commission for Human Development, the Commission for Ethnic Groups and the Episcopal Commissions for Social Works. Born in 1929, the bishop was ordained a priest for Ratchaburi diocese in western Thailand in 1951. 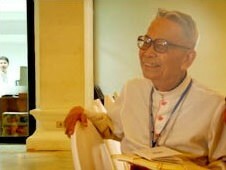 As a young priest, he was interested in social development ministry, but he became actively involved only from 1965. He served as secretary of the Office for Human Development of the Federation of the Asian Bishops´ Conferences from 1974 to 1976, the year he was ordained a bishop. From 1978 to 1984 he was chairman of the same office.